Sunday morning started with very sore backs. The bed at our hotel was SO stiff and uncomfortable. After stretching out for a bit, Holly and I hit Ken's House of Pancakes in Hilo. Even though I felt fine, I ordered the ROUGH NIGHT omlette which was an omlette topped with chili and cheese. 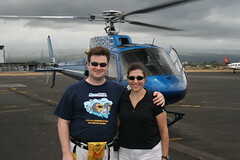 After making sure everything was packed, we asked for a late checkout so we could leave our luggage at the hotel instead of the trunk while we went on our Blue Hawaiian Helicopter Circle of Fire and Waterfalls tour. The tour was absolutely breathtaking. Our pilot, Dan, did a great job narrating as he flew. We got to see the edge of Hawaii where volcanic eruptions cause the island to grow every day and a huge area that was devistated by lava flow, demolishing an entire community of houses. We even saw a "skylight", which allowed us to see actual flowing, red lava. Just being in a helicopter for the first time was exhilarating enough, but the amazing scenery around us was completely amazing. Following the tour, we headed back to our hotel to check out and head over to the other side of the island. Holly had planned stops along the way, including the Hawaii Tropical Botanical Garden where we walked through the gardens and along the ocean. The flowers were gorgeous. After the garden, we stopped at "What's Shakin'", a smoothie and sandwich place on our way to the hotel. Good stuff! Then, we drove for about two hours and arrived at our hotel at Waikoloa Beach. Our travel agent screwed up and had booked us for 4 days starting the day we're supposed to check out! Luckily, the woman behind the counter was on the ball. She got us into an even nicer room than we had originally booked and fixed our reservations. Yay! We relaxed in the room for a bit and then had dinner at Roy's Restaurant. Oh. My. God. I had the Hawaiian Style Misoyaki Butterfish and it was the best fish I've ever tasted. While Holly ordered a crabcake appetizer and enjoyed it, we really shared my butterfish. Wow. Then, Holly had the chocolate souffle and I had a coconut brownie. The food was so good that we're going back in a couple days. Be sure to check out the photos we've taken.